I pick #1, Hien! I like seeing the action of the water and landing to the moment you took the shot. To be kind to #2, I think it is great as well and if that’s the only crop you could do, because as in the original photo, you nailed the crisp details! Thank you for your feedback, Donna! I like the second crop better (and I’d crop another 1/4″ off the right hand side – just a very tiny bit). 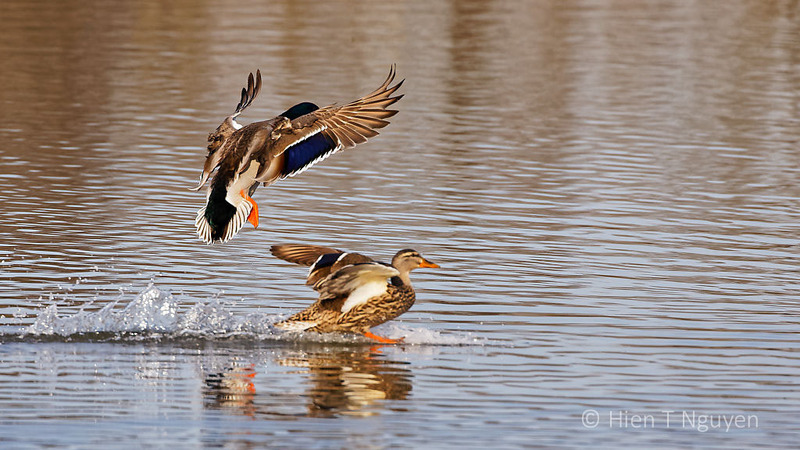 Whether the mallard is taking off or landing seems irrelevant to me. To me it’s more about the visual ‘balance’ of the birds within the frame i.e.composition and #2 looks better balanced. I’m so intent on looking at the birds, that I don’t even notice what they’re doing. Even though #1 is correct in the sense that the mallards are landing and making that wave trail on the water, the birds facing to the right looks like they are about to swim off the frame and makes me feel as though I’m about to lose my subject. If you felt #1 was correct per se, then I could crop a tiny bit off the left hand side and add back a tiny bit on the right hand side. I find sometimes, 1/4-1/2″ cropping of any side, can make all the difference. #2 makes it look like the subject is coming in to your line of view and becoming part of the overall composition and final result. If you like, change it in your mind to a painting. 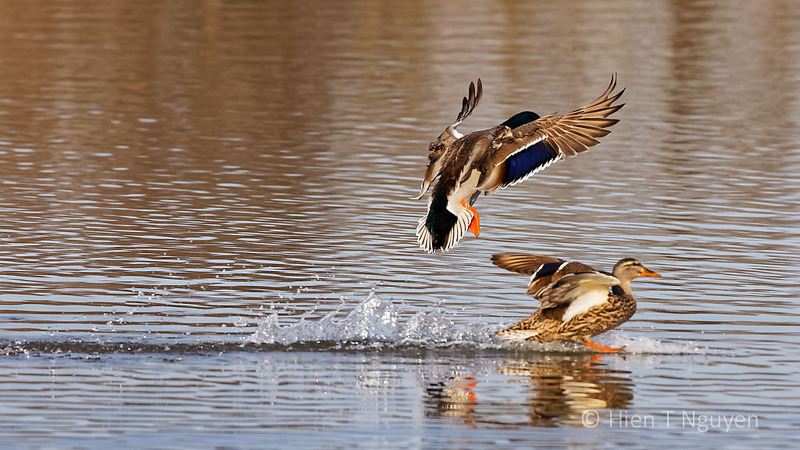 Would you paint the mallards so close to the righthand side of your canvas? But we’re all different and its what you like as the photographer – your vision of what you like – that matters. Thanks Vicki! You made some very good points. There are many Mallards at the lake, taking off and landing all the time. I will try photographing them again this week and see what happens. Thank you for your feedback, Marcus! I think the first one. As Eliza said it shows the landing. 2 could be confused with them taking off. Adding a title about what is happening is always helpful. Thank you for commenting, Tim! I like the first shot. That long stream of water…….they really did have a long path! They did make a big, long splash. Thank you Lois! The first seems better to me as it shows the landing path. Thank you for your feedback, Eliza!